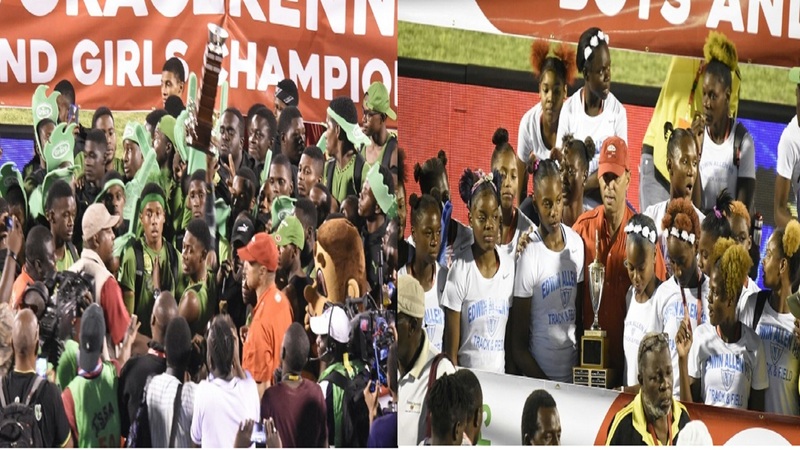 The combination of pictures show Calabar High and Edwin Allen High posing with their championship trophies after they retained their titles at the 2018 ISSA/GraceKennedy Boys and Girls' Athletics Championships at the National Stadium, on Saturday night. (PHOTO: Marlon Reid). Calabar High and Edwin Allen High on Saturday night retained their respective titles at the 2018 ISSA/GraceKennedy Boys and Girls' Athletics Championships at the National Stadium. Red Hills Road-based Calabar High scored a runaway victory over Kingston College (KC), but Edwin Allen had to survived a two pronged attack from Holmwood Technical and Hydel High. Calabar, which entered the fifth and final day on 161 points, 34 ahead of KC, ended the championships with 368.50 points after the 42 finals were scored for their seventh straight title and 28th overall. They beat second-place KC by 90.50 points. KC finished with 278 points. Jamaica College(JC) with 224.50. St Jago High (146), St Elizabeth Technical High (95), Wolmer's (94.5), Petersfield High (69), Excelsior High (35), Rusea's High (32), Buff Bay High (32) complete the top 10. Edwin Allen High, which entered the final day on 148 points, 39 points ahead of Holmwood Technical, took the girls' championships with 324 points after the 46 finals were scored, 35 ahead of second-place Hydel High, for their fifth straight victory and sixth overall. Kevona Davis of Edwin Allen cools down on the track after her record victory in the Girls' Class 2 200m final on Saturday. (PHOTOS: Marlon Reid). Hydel High finished on 289 points, while Holmwood Technical ended third on 285. St. Jago High (178), Vere Technical High (105.50), Excelsior High (103.50), Manchester High (53), Petersfield High (51), Wolmer's (48.50) and Rusea's High (46.50) complete the top 10. The championships ended in disappointing fashion for Calabar High as they were disqualified, based on ISSA Rule 5b, after scoring an emphatic victory to break the record in the Boys' 4x400-metre relay open. Petersfield High, which had finished second in 3:10.64, were awarded first place. JC (3:10.93) moved up from third to second, while Rhodes Hall High (3:11.06) moved up from fourth to third. Calabar High, with Christopher Taylor on the anchor leg, had completed the victory in 3:05.60 to erase the previous record of 3:06.76 they set in 2015. However, the record will remain following the disqualification, which was announced 45 minutes later when Calabar were still celebrating their big victory over main rival KC. Hydel High also had their number taken down after closing the championship with victory in the Girls' 4x400-metre relay open. However, following an objection, the result was reinstated to its original position, 45 minutes later. During that scenario, Holmwood Technical had moved from third place to second in the championship and ahead of Hydel High. Hydel High came home in 3:33.71 to beat Edwin Allen, which clocked 3:37.86. Earlier, Kevroy Venson of Calabar High stunned KC’s Ugandan athlete Arymanya Rodgers by taking the Boys' 5000-metre open. Rodgers who won the event last year very easily was stalked all the way by Venson, who stepped up to the event this year. Both athletes were paced together entering the final lap, but when Venson kicked for home coming off the final bend, Rodgers - who was bumped around repeatedly in the race - failed to respond as the troubled trip he had taken its toll. Venson completed the trip in 15:14.86 to Rodger's 15:15.86. Renardo Johnson of St Jago finished third in 15:19.20. The victory handed Venson the 1500m-5000m double. Venson, on Friday, scored an impressive victory in the Boys' Class 2 1500 metres when leading home his teammate Rivaldo Marshall. Last season he won the 1500-metre title by beating Rodgers, who this year skipped the event for the 2000-metre steeplechase open, which the Ugandan easily won on Thursday night. Among the highlights on the track were Kevona Davis' record run in the Girls' Class 2 200 metres final and Dejour Russell's impressive victory in the Boys' Class 1 110-metre hurdles, also in record time. 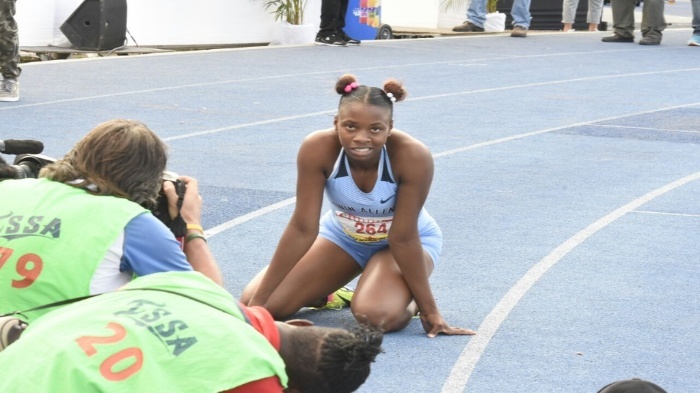 Davis, Edwin Allen standout sprinter, clocked 22.72 seconds to erase the 22.92 she achieved on Thursday in the semi-finals when breaking the 23.13, which Anneisha McLaughlin of Holmwood Technical set 16 years ago. The time was also a new national youth record. The 200-metre victory, which sealed the Girls' Class 2 sprint double for Davis, came 24 hours after the 16-year-old took down the 100-metre record with 11.16 seconds. Davis had earlier that day clocked 11.35 seconds in the opening heat of the semi-finals to better the previous record of 11.40 set by St Jago's Kimone Shaw in 2016. The KC pair of Adrian Kerr (left) and Nkrumie Bouwahjgie after finishing first and second in the Boys' Class 2 200m final on Saturday. 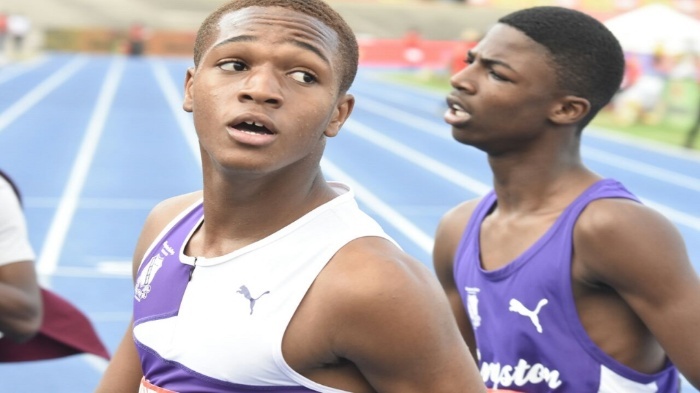 There was another record in the 200 metres as Kingston College's (KC) Adrian Kerr clocked 21.69 seconds to win the Boys' Class 2 final. Kerr beat the previous record of 21.72 seconds set by Tyreke Wilson of Calabar High in 2014. It was a one-two finish for KC as the 100-metre winner in record time, Nkrumie Bouwahjgie finished second in 21.74 seconds. Russell, Calabar High outstanding hurdler, destroyed the field to achieve his record in the Boys' Class 1 110-metre hurdles final. The 17-year-old clocked a super-fast 13.10 seconds to shatter his 2017 mark of 13.21 seconds. The 13.10 clocking also represents the second fastest national junior time. It was a one-two finish for Calabar High as Orlando Bennett won the battle for second with 13.30 seconds. The sprint hurdles finals produced three other meet records. 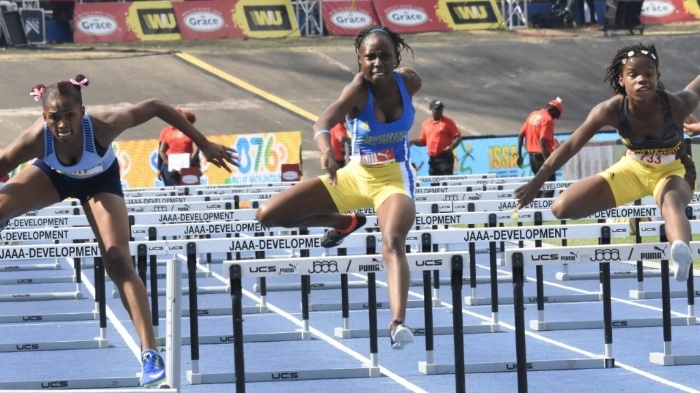 Ray-donna Lee of Hydel High won the Girls' Class 2 100-metre hurdles final in 12.95 to erase the 2017 mark of 13.03 set by Vere Technical standout Britany Anderson. Crystal Morrison of St Jago finished second in 13.06. Gabrielle Matthew of Hydel High (centre) moves ahead of Janela Spencer (right) of Manchester High and Salieci Myles of Edwin Allen to win the Girls' Class 3 80m hurdles on Saturday. Neil-matthew Sutherland of Jamaica College accounted for the Boys' Class 2 110-metre hurdles meet record, clocking 12.87 to beat the Calabar High pair of David Thomas (13.20) and David Williams (13.33). The previous record of 12.90 was set in 2017 by St Jago's Jahvel Granville. The other sprint hurdles record came from St Jago's Vascianna Vashaun who clocked 13.35 seconds to beat the previous best of 13.45 set by Calabar's Michael O'Hara in 2013. Vashaun's teammate Jahvel Granville finished second in 13.62. Earlier, KC scored a famous victory through Dashawn Morris in the Boys' Class 1 400-metre final. 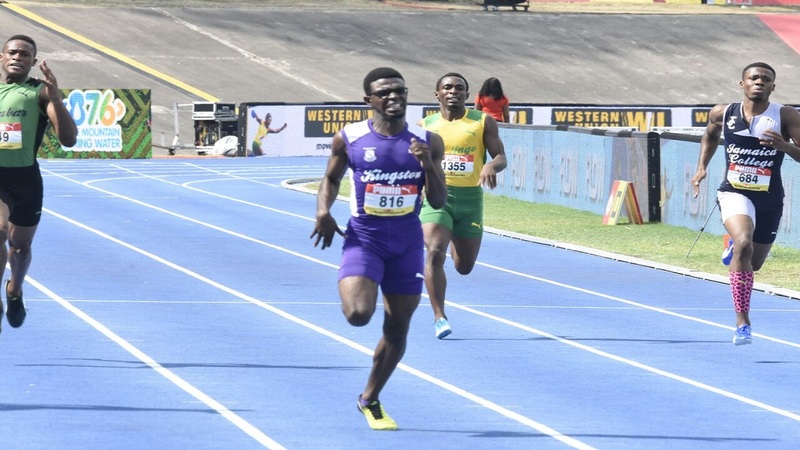 Morris did not disappoint his many supporters as he turned back the challenge of Calabar High's Anthony Carpenter and Chevannie Hanson of Edwin Allen to cross the line in 45.09 seconds. Carpenter clocked 45.47, while Hanson hit the line in 46.03. It was the third time this season that Morris had stopped Carpenter, whom Calabar had put all their faith in after pulling Christopher Taylor from the event. Morris had emerged as a main contender for the title after clocking 45.93 seconds in the Corporate Area Championships on March 10, the second regional meet of the Digicel Grand Prix Series, to place a close second to Taylor (45.84) and then returned to easily beat Carpenter at the CARIFTA Trials. And then in the semi-finals on Friday, Morris clocked 45.63 seconds to beat Carpenter (45.91). KC also secured another famous victory over Calabar High, this time in the Boys' 1600-metre sprint medley, also in a meet record time. The quartet of Colin Rowe, Javad Black, Kevin McPherson and Kenneil Dewar completed the course in 3:24.22 seconds to erase the previous record of 3:25.78 they set in 2014. Second-place Calabar (3:24.80) and third-place Holmwood Technical (3:25.04) also clocked faster times than the previous record. Holmwood Technical won the Girls' 1600-metre sprint medley in 3:57.77, beating Spalding High, which clocked 3:58.41. In the Girls' Class 1 400-metre final, Shiann Salmon led home a one-two finish for Hydel High. Salmon clocked 52.05 seconds for the victory, with Young crossing the line in 52.82 seconds. St Elizabeth Technical High School's Stacey-Ann Williams finished third in 53.30. 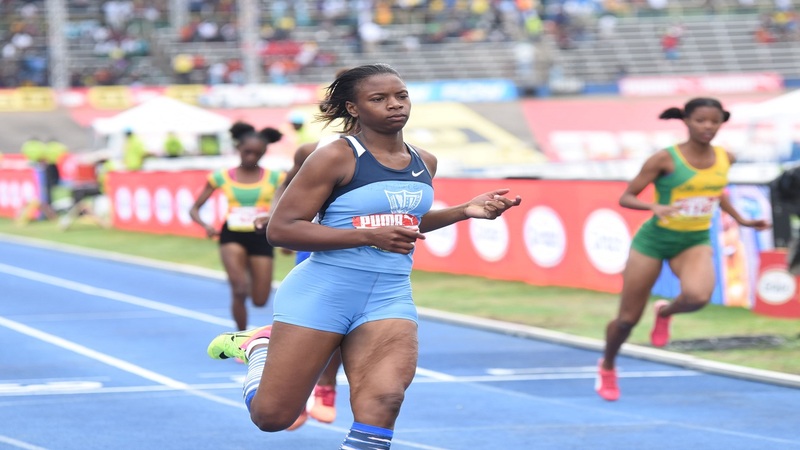 Over in Class 3, Holmwood Technical High's Rickiann Russell (53.60) beat Hydel High's Oneika McAnnnuff (53.77) for the girls' title, while Calabar High's Lavoughn Douglas (49.38) outbattled St Elizabeth Technical High School's Adrian Nethersole (49.59) for the boys' title. Tyreese Williams (49.83) finished third while his KC's teammate Lenox Barrett ended fourth in 50.70. Daniella Deer of Holmwood Technical clocked 53.06 to beat St Andrew High's Janielle Josephs (53.24) and Hydel High's Garriel White (53.34) to win the Girls' Class 3 400-metre final. And Antonio Watson (47.08) of Petersfield High came from well off the pace to catch Calabar High's Evaldo Whitehorne (47.15) close home in the Boys' Class 2 400 metre-final. Zidane Brown (47.73) of Glenmuir High finished third. In the field, Edwin Allen High's Fiona Richards made up for her surprising defeat on Wednesday in the Girls' Class 1 discus throw by taking the shot put title with a record throw of 14.93 metres, which erased the previous mark of 14.46 metres set by Janell Fullerton of St Jago High. Aiko Jones of Wolmer's Girls finished second with a throw of 14.07 metres, while St Jago High's Gabrielle Bailey, who upset Richards on the Class 1 discus, finished third with an effort of 13.94 metres. The Boys' Class 2 discus throw also produced a new meet record. Romaine Beckford of Buff Bay High won with a throw of 55.70 metres, which beat the previous mark of 53.41 achieved by Daniel Cope of Petersfield High in 2016. KC's Ralford Mullings finish second with a throw of 54.85 metres, which also bettered the previous record. The Hydel pair of Alana Reid and Shiann Salmon also closed out double on the day. Reid won the Girls' Class 4 sprint double after winning the 200 metres in 24.98 seconds from Wolmer's Mickaya Gardner (25.14) and St Jago's Asanneya Tomlin (25.31). Salmon stunned the field to win the Girls' Class 1 400 metres in a personal best 52.05, beating her teammate Charokee Young (52.82) and STETHS' Stacey-Ann Williams (53.30). On Friday, Salmon won the Girls' 400-metre hurdles in a new record time of 55.78.